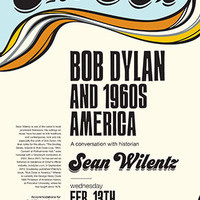 Sean Wilentz is one of the nation’s most prominent historians. His writings on music have focused on folk traditions and contemporary rock and roll, especially the work of Bob Dylan. His liner notes for Dylan’s album, The Bootleg Series, Volume 6, Bob Dylan Live, 1964: Concert at Philharmonic Hall were honored with a Grammy® nomination and an ASCAP-Deems Taylor Award for musical commentary. Wilentz has written liner notes for other notable reissues, including the full Carnegie Hall concert of the Clancy Brothers and Tommy Makem, recorded in 1963. He is also the co-editor, with Greil Marcus, of The Rose & the Briar: Death, Love and Liberty in the American Ballad (2004). Since 2001, he has served as historian-in-residence at Dylan’s official Website, www.bobdylan.com.